Washington voters will have a chance to make the state one of the most restrictive in the country for gun purchases and ownership; proponents say I-1639 will save lives, opponents say it's onerous and likely unconstitutional. Predicting how the proposed laws contained in Initiative 1639 will save lives or trample on the rights of gun owners is up to political interpretation. What isn’t up for discussion is that the 30-page initiative, on the Nov. 6 ballot, will vault Washington into the vanguard of state gun-restriction laws with Massachusetts, Hawaii and California. Washington state isn’t barren of gun regulations. The state already has roughly 43 gun-related laws or regulations on the books, according to researchers at the Boston University School of Public Health. Alaska, by comparison, has just two state gun laws in addition to the requirements of the federal government that apply everywhere. Gun-control proponents want Washington to do more. Aspects of I-1639, such as enhanced background checks and raising the purchase age for semi-automatic firearms from 18 to 21, are components that would set Washington state apart from most states. The measure would also require firearms training before a semi-automatic rifle can be purchased; a 10-day waiting period after the purchase of a semi-automatic rifle, and add a class C felony to the books for gun owners whose firearm is accessed by a person prohibited from having a firearm. The class C felony would be the most severe in the nation for a violation of storage laws. Siegel and his colleagues at BU put together the State Firearm Laws database comparing gun laws across the nation. Siegel approaches gun violence as a public-health issue. He believes that, viewed from that perspective, the issue shouldn’t be so polarizing. Dave Workman, the senior editor of The Gun Magazine — a publication of the Bellevue-based Second Amendment Foundation — agrees that both sides can work together to craft laws that protect the public while not trampling on the rights of gun owners. That is exactly what will need to happen, Workman said, if gun-law proponents want to get something done should I-1639 fail. A portion of I-1639’s constellation of regulations, called Child Access Prevention Laws, focus on firearms access and child safety. Twenty-seven states and Washington, D.C., have such laws. Siegel said research has shown that the number of gun laws, and how the laws work together, makes a difference in public safety. What emerges from the BU database is that states with a long list of complimentary firearm laws, including Child Access Prevention Laws, have lower suicide and homicide rates, said Siegel, who sees a “strong relationship” between those numbers and gun regulations. The states with the prevention laws, but few other restrictions, have higher rates of gun violence. In 2016, the last year numbers are available, Massachusetts had 101 gun laws on the books with a suicide rate from guns of 1.89 per 100,000 people. New Jersey, with 67 gun laws, came in with the lowest suicide rate from guns at 1.8. 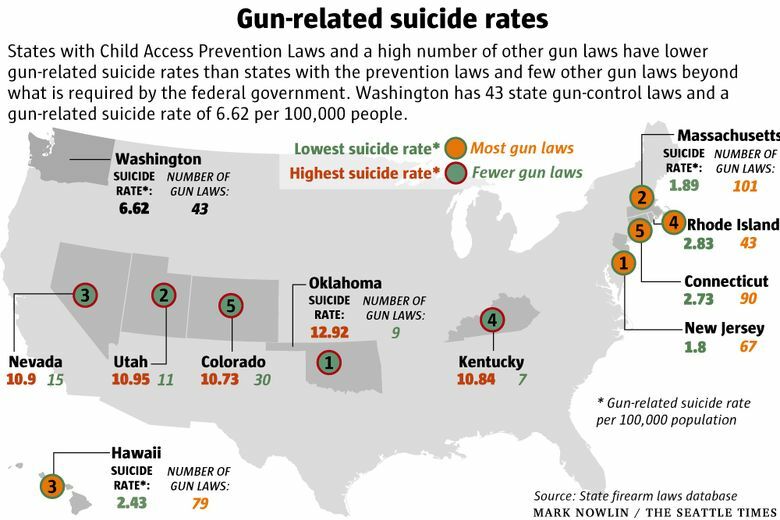 While Oklahoma, with nine state laws, has a suicide rate from guns of 12.92 per 100,000 people. Washington has 43 state gun laws and a gun-related suicide rate of 6.62, according to the State Firearm Laws database. Washington would have the 18th-highest suicide rate of the 27 states with Child Access Prevention Laws. The U.S. Centers for Disease Control and Prevention pegs the number of people who died in 2016 from gun violence in Washington at 616 people. Of that number, 515 of those were suicides. How has Massachusetts been able to pass so many firearm-control laws while legislatures across the nation, including Washington, struggled to pass similar laws? The difference is that Massachusetts recognized the need for gun-control laws as far back as 40 years ago, said David Linsky, a state representative. The Democrat, representing a suburban area southwest of Boston, has been a champion of gun laws during his 19 years in the Legislature. He became interested in the topic during his freshman year of college and immersed in the issue as a prosecutor for 14 years. Linsky said that everything in I-1639 is already on the books in Massachusetts and the variety and number of laws has helped keep the state’s homicide and suicide rates some of the lowest in the nation. “The issue of firearm violence is complicated. There isn’t one type of firearm violence. I believe that government needs to have a strategy for many types of provisions and laws to prevent the different types of firearm violence,” he said. Workman predicts I-1639 will be challenged in either federal or state court, possibly both, if it passes. If the measure does become law he is worried about how it will impact people between the ages of 18 and 20. Gun-control initiatives have fared well at the polls in recent years. In 2016 an initiative allowing court-issued protection orders to temporarily prevent someone deemed a danger to others or themselves from having access to a gun passed with 69.4 percent of the vote. In 2014 Washington voters passed a measure implementing background checks on private sales and transfers of firearms with 59.2 percent of the vote. On the same ballot, voters rejected a competing initiative that would have stopped the state from implementing background checks beyond what federal law requires. The measure lost with 55.3 percent of voters going against it. Bills dealing with guns had mixed results during the last legislative session. Washington’s Legislature passed bills banning bump stocks and the ability for people convicted of domestic abuse from having guns. A more comprehensive firearms bill, which would have expanded background checks and raised the age to buy semi-automatic rifles from 18 to 21, didn’t make it out of committee. Local jurisdictions are picking up where the Legislature has stopped short. King County, Seattle and Edmonds have all recently passed safe-gun-storage laws. The Second Amendment Foundation has filed legal challenges to the ordinances in Seattle and Edmonds, and a lawsuit against King County is anticipated. At one time or another the Legislature has passed on the chance to act on every element of the initiative, Paolini said. The 22-year-old lamented that in the early 1990s when Child Access Prevention Laws were first proposed in Olympia he wasn’t yet born. An earlier version of this story stated that I-1639 would require firearms training and a 10-day waiting period for all gun purchases. Those restrictions apply to semiautomatic rifles only.